This post is the ninth in our Spring 2016 series on processing digital materials. My first chance to process an email collection came when a small nonprofit organization in the mid-Atlantic selected my institution as the home for its records. The organization was closing its doors after several decades of advocacy around government transparency. My contact, Fergus, made clear from the beginning that he wanted us to preserve the organization’s email as part of the project. I explained the features of ePADD, emphasizing the filtering mechanisms and the ability to isolate items that contained sensitive Personally Identifiable Information (PII). Based on Fergus’s enthusiasm, I naively assumed that the employees’ commitment to transparency extended to their own inboxes. When Fergus announced our intentions to current and former employees, the protests began pouring in. There were several reasons for concern: many employees used their work email addresses for personal correspondence, the accounts contained information from a number of confidential mailing lists, and there were conversations with politically-active people who had expectations of confidentiality. At this point, I also learned that most employees of the organization no longer had access to their accounts and were unable to clean up sensitive information. I knew ePADD could make short work of the sensitive PII and mailing lists. However, the private conversations were a big part of the appeal—I couldn’t promise to filter those, but I did offer to restrict the accounts for a period of time and emphasized that access would be onsite only. Later I suggested that transfers could be opt-in, but the damage had already been done. The last straw came when federal government staff got wind of the plan and began voicing their concerns. We had to cancel the project in the face of overwhelming opposition and continued on with the rest of the collection. Does your organizations have any official policies related to use of its email accounts? Is email expected to be part of the public record? How are employees notified of this policy and when? What is the email culture at your organization? Do employees routinely use work email for personal reasons? What kind of work-related email exchanges take place on a daily, weekly, or monthly basis? Are any of these of a sensitive political nature? Will any of the work-related content need to be restricted? For how long? Are the accounts of former employees retained? For how long? How long do they retain access to the account after leaving the organization? Taking email records from individuals who continue to work in the field requires a sensitive touch. I’ll be better prepared next time to deal with the very real difficulties of convincing people to pry open their inboxes. Despite the technical challenges of digital preservation, I’ve discovered that acquisition is sometimes the hardest part of the process. The organization has been anonymized to prevent further consternation for former employees. Name changed to protect the harried. Angela White is the Philanthropic Studies Archivist at IUPUI in Indianapolis. She collects the records of nonprofit organizations and fundraisers to support the work of the Lilly Family School of Philanthropy. She is currently in conversations with a number of individuals about accessioning their email records. This post is the seventh in our Spring 2016 series on processing digital materials. This quick report for the practitioner drew from the “Bagger’s Enhancements for Digital Accessions” post prepared for the Library of Congress’ blog The Signal. In the past, the Indiana Archives and Records Administration (IARA) would simply receive, hash and place digital accessions in storage, with the metadata keyed into a separate Microsoft Access Database. Currently, IARA is automating many of its records processes with the APPX-based Archival Enterprise Management system (AXAEM). When the implementation concludes, this open source, integrated records management and digital preservation system will become the main accessioning tool. For now, and for accessions outside AXAEM’s reach, IARA uses Bagger. Both AXAEM and Bagger comply with the BagIt packaging standard: accessions captured with Bagger can later be readily ingested by AXAEM. IARA anticipates time gains and record/metadata silos reduction. IARA aims to capture required metadata for each accession in a consistent manner. Bagger allows this to be done through a standard profile. IARA developed a profile inspired by the fields and drop-down menus on its State Form (SF 48883). When that profile was initially implemented, Bagger scrambled the metadata fields order and the accession was not easily understood. John Scancella, the lead Bagger developer at the Library of Congress implemented a change that makes Bagger now keep the metadata sequence as originally intended in the profile. 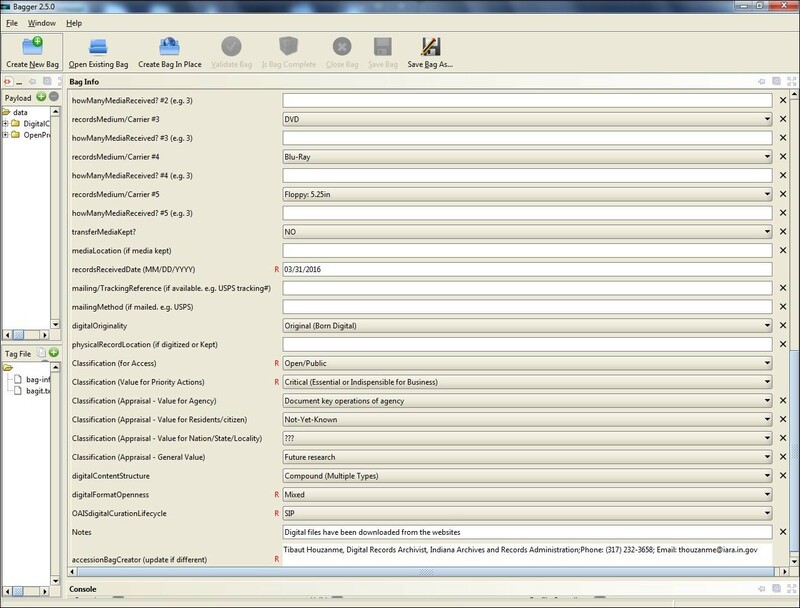 IARA then added additional metadata fields for preservation decisions. With colleagues’ feedback, it appeared IARA’s profile could be useful to other institutions. A generic version of the profile was then created, that uses more generic terms and made all the metadata fields optional. This way, each institution can decide which fields it would enforce the use of. 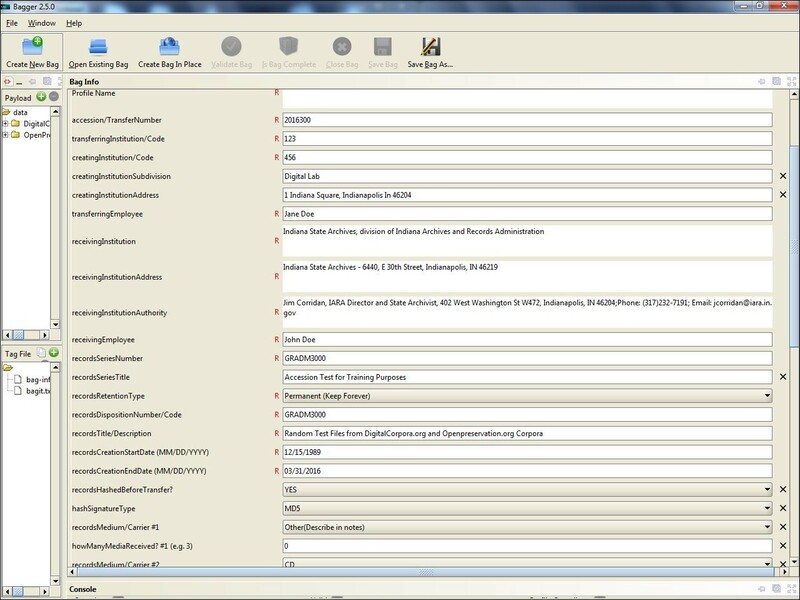 This makes the generic profile useful to most digital records project and collecting institutions. The two profiles display similar metadata fields for context (provenance, records series), identity, integrity, physical, logical, inventory, administrative, digital originality, storage media or carriers types, appraisal and classification values, format openness and curation lifecycle information for each accession. Together with the hash values and files size that Bagger collects, this provides a framework to more effectively help evaluate, manage and preserve long term digital records. This test accession used random files accessible from the Digital Corpora and Open Preservation websites. To use the IARA’s profile, its generic version or any other profile in Bagger, download the latest version (as of this writing 2.5.0). To start an accession, select the appropriate profile from the dropdown list. This will populate the screen with the profile-specific metadata fields. Select objects, enter values, save your bag. For detailed instructions on how to edit metadata fields and obligation level, create a new or change an existing profile to meet your project/institution’s requirements, please refer to the Bagger User Guide in the “doc” folder inside your downloaded Bagger.zip file. To comment on IARA’s profiles, email erecords[at]iara[dot]in[dot]gov. For Bagger issues, open a GitHub ticket. For technical information on Bagger and these profiles, please refer to the LOC’s Blog. Tibaut Houzanme is Digital Archivist with the Indiana Archives and Records Administration. John Scancella is Information Technology Specialist with the Library of Congress. This is the sixth post in our Spring 2016 series on processing digital materials. As we conceived of and developed our dataset curation workflow for digital datasets ingested in the IDB, we turned to archivists in the University Archives to gain an understanding of their approach to processing digital materials. [Note: I am not specifying whether data deposited in the IDB is “born digital” or “digitized” because, from an implementation perspective, both types of material can be deposited via the self-deposit system in the IDB. We are not currently offering research data digitization services in the RDS.] There were a few reasons for consulting with the archivists: 1) Archivists have deep, real-world curation expertise and we anticipate that many of the challenges we face with data will have solutions whose foundations were developed by archivists and 2) If, through discussing processes, we found areas where the RDS and Archives have converging preservation or curation needs, we could communicate these to the Preservation Services Unit, who develops and manages Medusa, and 3) I’m an archivist by training and I jump on any opportunity to talk with archivists about archives! This post is the fourth in our Spring 2016 series on processing digital materials. When it comes to working to process large sets of electronic records, it’s all too easy to get so wrapped up in the task at hand that when you finally come up for air you look at the clock and think to yourself, “Where did the time go? How long was I gone?” Okay, that may sound rather apocalyptic, but tracking time spent is an important yet easily elided step in electronic records processing. At the University of Minnesota Libraries, the members of the Electronic Records Task Force are charged with developing workflows and making estimates for future capacity and personnel needs. In an era of very tight budgets, making a strong, well-documented case for additional personnel and resources is critical. 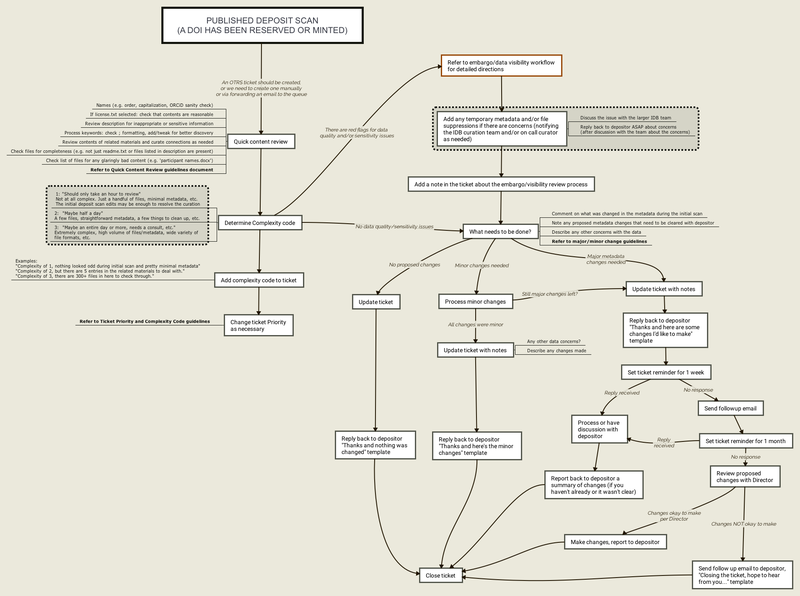 To that end, we’ve made some efforts to more systematically track our time as we pilot our workflows. Chief among those efforts has been a customization of the Data Accessioner tool. Originally written for internal use at the David M. Rubenstein Rare Book & Manuscript Library at Duke University, the project has since become open source, with support for recent releases coming from the POWRR Project. 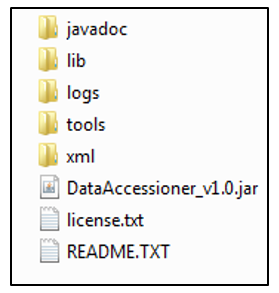 Written in Java and utilizing the common logging library log4j, Data Accessioner is structured in a way that made it possible for someone like me (familiar with programming, but not much experience with Java) to enhance the time logging functionality. As we know some accession tasks take a few minutes, others can run for many hours (if not days). Enhancing the logging functionality of Data Accessioner allows staff to accurately see how long any data transfer takes, without needing to be physically present. 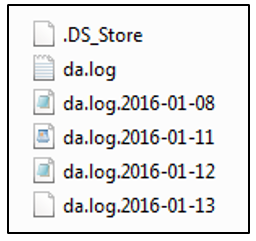 The additional functionality was in itself pretty minor: log the time and folder name before starting accessioning of a folder and upon completion. The most complex part of this process was not writing the additional code, but rather modifying the log4j configuration. Luckily, with an existing configuration file, solid documentation, and countless examples in the wild, I was able to produce a version of Data Accessioner that outputs a daily log as a plain text file, which makes time tracking accessioning jobs much easier. You can see more description of the changes I made and the log output formatting on GitHub. You can download a ZIP file with the application with this addition from that page as well, or use this download link. With this change, we are now able to better estimate the time it takes to use Data Accessioner. Do the tools you use keep track of the time it takes to run? If not, how are you doing this? Questions or comments can be sent to lib-ertf [at] umn [dot] edu. Kevin Dyke is the spatial data analyst/curator at the University of Minnesota’s John R. Borchert Map Library. He’s a member of the University of Minnesota Libraries’ Electronic Records Task Force, works as a data curator for the Data Repository for the University of Minnesota (DRUM), and is also part of the Committee on Institutional Cooperation’s (CIC) Geospatial Data Discovery Project. He received a Masters degree in Geography from the University of Minnesota and can be reached at dykex005 [at] umn.edu.